Three-wheeled motorcycles – or trikes, as they are commonly called – are something of a ‘weird Alice’ in the biking world. They lean the wrong way, they take up too much road space, they have none of the benefits of a car or a motorcycle. But, in certain markets, notably the US, trikes are immensely popular, especially amongst the senior crowd and riders who are disabled, but still want to experience the joy of riding in the wind. Can-Am is one of the best known trike brands, and its range offers trikes from plush tourers to sporty run-abouts. In the case of the 2016 Can-Am Spyder F3-S, what began as a turbo-charged concept inspired by NASCAR racing cars has turned into reality. Coming with ‘Sports’ mode, this trike boasts of the ability to let the rider ‘drift’ to his or her heart’s content. 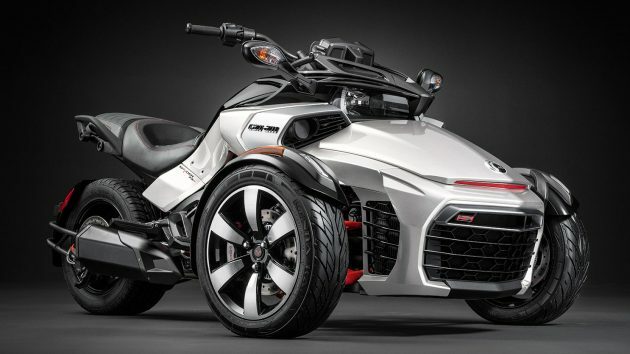 Looking faithfully similar to the concept trike, the 2016 Can-Am Spyder F3-S lets the ride let loose with “controlled rear tyre spins,” while maintaining vehicle stability. Manually activated, Sport mode switches off the Spyder F3-S’s traction control. However, the stability control remains activated, preventing the Spyder F3-S from rolling over. Can-Am claims the 2016 Spyder F3-S produces 115 hp and 130 Nm of torque, certainly enough to be entertaining, whether on two or three wheels. 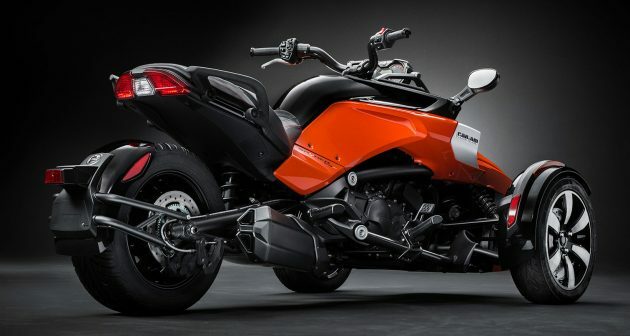 The Can-Am Spyder F3-S is powered by a Rotax three-cylinder EFI liquid-cooled inline engine, mated to a six-speed manual or semi-autimatic gearbox with reverse gear. Braking is by Brembo and suspension by Fox, with a full suite of electronic stability aids. Can-Am trikes are represented in Malaysia by BRP-Eon. There are two models currently on sale – the Can-Am Spyder RT-S at RM149,138 and the RT Limited at RM170,050. Both prices are on-the-road. Beautiful looking monster. Very niceee, I like!! Should buy this for Big Boss and all his Cabinet members. Then they don’t need to have 10 outriders shoving and pushing traffic to make way for them. Everyday, every hour, got so many outriders pushing traffic. By law, only the Agong can have outriders. This will safe the PDRM hundreds of outriders, all of whom, can be used to patrol neighborhoods to prevent break-ins and burglaries and be used to fight real crime. must use the bike lane ka? Not a big fan of bikes and trikes, but i must admit, it exudes sexiness and manlinesss for me, putting specs aside. Do you need a bike license or a car license for this? how about the prise , is it brand new or used ?